I would love this; buying more than three skeins of anything is usually cost-prohibitive for me. I love this shawl. Especially the adorable spine. Looking forward to knitting it. If this copy became mine it would make it sooner rather than later. Thank you for the giveaway! Would love to have this book!! Pretty shawl, I love the spine. This book looks great. I would love to win it. A lovely book-I would so love to win! Thank you for the opportunity to win one! I'm just starting to bead shawls and fear it is a slippery slope!! This book would help me so much with my Christmas knitting. So far behind. The shawl looks amazing! What a great book. Thanks for doing a giveaway. Thanks Romi for the opportunity to snag this book filled with knitting gems. Might be able to cross it off my Xmas list. Would love to win this book! Looks like just the one for knitting Christmas gifts. Enjoy your blog! 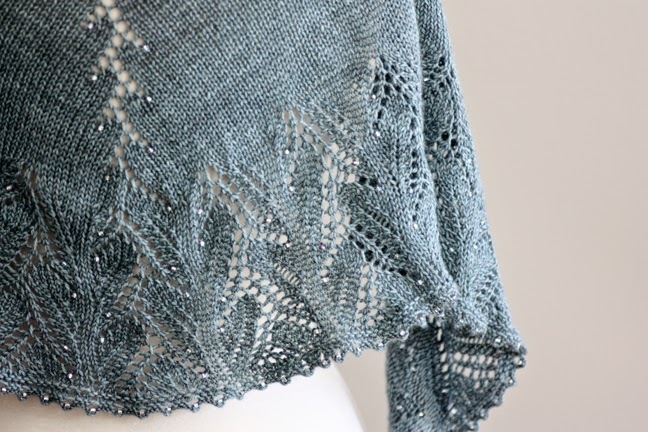 Wow, that Tanis shawl is lovely!! WHOOT! 1st, I'm never 1st. Absolutely beautiful patterns. I would love to win the book and knit the patterns. The book looks splendid -- and I'd love to win a copy! Great book - I bought this book for myself, but would love to win a copy for my sister. I have too many 3 skein bunches of yarn for which I need inspiration! beautiful! I haven't gotten this one yet, so I'd love to be in the drawing. thanks! I would love a chance to win 3 Skeins or Less! Looks like a lovely book, I'd love to own it. Wow, Romi - so sweet of you to offer this. Looks like a great collection! I really want to knit Tannis the shawl and several other patterns I have seen from this book! Gorgeous! oooh that book looks great! Romi, your patterns are such a joy to knit! Thank you for all that you do! I'd love to gift this book to a friend. I would love to win a copy of Tanis' book. What a great concept. Thanks for sharing. Tanisha is so pretty! Romijn you rock! It's nice to see some Monday Musings again, Romi! I checked out the projects on Ravelry, and it's a great set of lovely items to knit. Your shawl is in fitting company! Please enter me in the giveaway. The book looks very interesting. Love the shawl. Thank you for the giveaway. I commute on a bus to work, so smaller projects like the ones in this book are perfect! Would love to win this book! Love that Tanis shawl. Would love to win this book, and I have the perfect yarn for the shawl! I would love this book and your Tanis Shawl too! I would love to make the Tanis Shawl. Thanks for the giveaway. I could use a new book to cheer me up after these recent cold, dark, rainy days! This is a really beautiful shawl. I have always wanted to learn to incorporate beading into my knitting and this would be an ideal project to do so. Thank you for the chance to win this lovely book, it would really help to get the stash under control! I'd love to win this book - and knit Tanis - thank you! oh my yes. this book would be wonderful to have. I've been wanting to get this book and, of course, have faved Tanis (the shawl). Great contest prize. Oh my, another wonderful ROMI knit. If only I could keep up with the volume of wonderful patterns. Stunning! Another incredible creation! Awesome giveaway!! Great book! I and have some Tanis fiber that would look lovely in that shawl. I'd love a copy of this book. I am so in love with the beads down the back of the shawl keeping everything crossed for the win!! Beautiful shawl! I would love the book. Absolutely beautiful. Would love a copy. wow, this is a beautiful shawl! i would love to win a copy, and start knitting it right away! What a lovely new book! I'd love to win a copy. Of course, I would love to have a copy of this book! Yes, please! I've been looking at that book as there are some wonderful patterns in there - yours, of course! I love the spine of Tanis and that border is so "shiny". I don't usually like to attract attention but I certainly would love to wear a shawl that is such a distraction. I hear there are some other pretty things in the book, too. I love your Tanis shawl (I keep gazing at it online...) and looking through the book's patterns, I think I would like to make many of those as well! I am always a fan of Romi patterns and the rest of the book is a bonus! Just so very very lovely! Just lovely. I need to knit the Tanis shawl! I love books that have a variety of smaller (two or three skein) projects that I can make as gifts. Always love your shawl patterns! Wish I had more hours in the day to knit them all. What a beautiful shawl! I love it and would love this book of smaller projects. That shawl is so pretty! I'd love to win the book. That shawl is spectacular! I'd love that book. Many lovely patterns, I would love to win this book! Thank you for the chance to win this book. 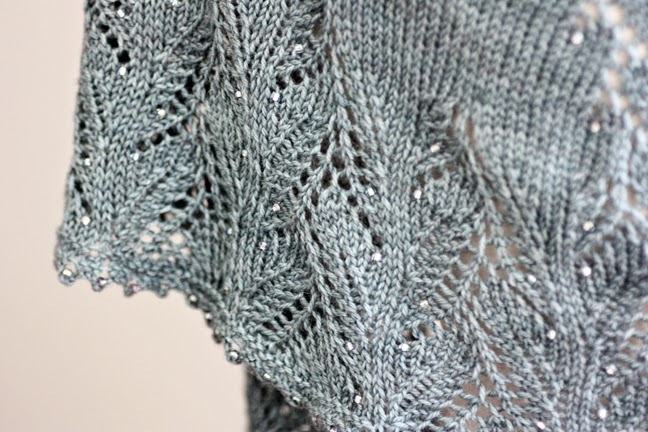 I love the patterns in it & really would like to knit up the Tanis shawl. As always, your shawl is gorgeous! This sounds like a great book for thinning out the stash and I'd love to win. I have been itching to knit this shawl so throw my name in!! We love you Romi!! I so need to knit this shawl! Absolutely beautiful, especially the elegant beaded spine and border. Looking forward to knitting this one..
What a wonderful source for using up 3 skeins of stash and/or lovely new shawl yarn. Pick me! Pick me! Thanks, Romi. Tanis will go in the queue. My next adventure into knitting is to learn how to use beads! This would so make the adventure more exciting. This is such a lovely design. And your idea to have a giveaway is very much appreciated! Another amazing pattern! I would love a copy of the book! You are so generous. I've been really into accessories lately, this is right up my alley! Absolutely lovely. Thank you for this opportunity. This looks like a lovely book. Thanks for sharing. I would love to win this book and the I could knit the shawl, it would be a great birthday present. Wow! There's a lot of beautiful patterns in that book. Would love to add that to my library. What a great book! The shawl is gorgeous as are (I'm sure) all the other patterns. Thank you for the chance to win a copy. Oh hh, pretty! Would love to win this book! I'm in love with the shawl and the yarn combo is amazing! Gorgeous shawl! I would love to win! 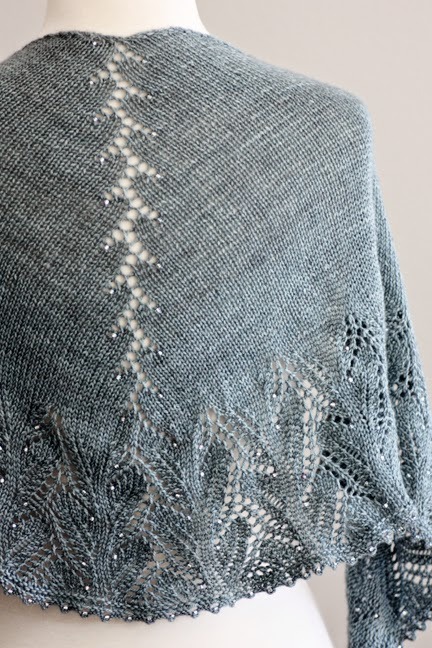 I do love this shawl, and would love a copy of the book. Beautiful book! So many gorgeous projects...which to start first?